As a small fire struck the much-delayed AIDAprima in Nagasaki last week, we have a look at the role the new ship will play in the German market, where she will become the largest cruise ship in the market for the next three or four years, filling a role similar to the Britannia in the UK. Down Under, meanwhile, we have new of yet another river cruise operator expanding into ocean cruising, with a recent order in Croatia for a 16,500-ton 228-berth luxury expedition vessel to be called the Scenic Eclipse. Finally, we have a quick look at recent activities at Columbus Cruise Services as it reaches its first anniversary of being based in Hamburg. A small fire that broke out last week on AIDA Cruises’ new flagship AIDAprima has served to bring her back into the news again. The shipyard’s fire brigade and local authorities were able to contain the blaze quickly. The new flagship of the German cruise fleet is being built at the Nagasaki shipyard of Mitsubishi Heavy Industries in Japan. The new ship’s delivery has already been delayed several times. She was scheduled to debut in the first half of 2015. This was then pushed back to the second half of 2015, then again to December. Last month she finished her third set of sea trials. While AIDAprima is now due to sail on her maiden voyage from Hamburg on April 30, the latest incident has raised fears that her introduction could be delayed even further. Bur this year, just as P&O Cruises’ Britannia became the largest dedicated cruise ship to serve the UK market, so the AIDAprima will become the largest cruise ship to serve Germany, a country that has recently surpassed the UK in passenger volumes. With two 180,000-tonners ordered from Meyer Werft in Germany, however, for delivery in 2019 and 2010, Germany will indeed be in the supremacy in Europe, not only with its largest cruise ships, but also with ships that were actually home-built in Germany. 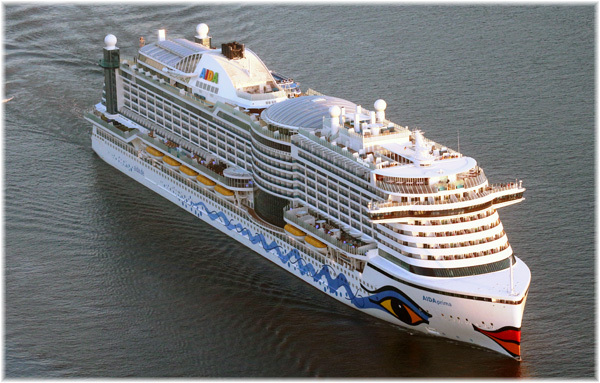 Like the AIDA fleet, however, the new ships will likely be registered in Italy, even if managed from Hamburg by the newly-establish ship management company Carnival Maritime. Meanwhile, Costa Cruises will have two sister ships, which although they will be Italian-registered will be built not in Italy but in Finland. Further losses have been sustained since that will see Mitsubishi not building any more cruise ships, especially since sister the affiliated NYK sold its interest in Crystal Cruises to Genting Hong Kong last year. Australian river cruise operator Scenic is moving into ocean cruising, with the announcement last week of an order for a new 16,500-ton, 228-berth ocean-going cruise ship to enter service in 2018. Scenic is not the first river cruise operator to enter deep sea cruising as the line was beat to the post by Viking Cruises, who last year introduced the new 930-berth Viking Star. Sister ship Viking Sea will enter service later this year. Saga Cruises also started in the river cruise business before buying the 585-berth Saga Rose in 1997 and CroisiEurope expanded into coastal cruising with its 200-berth Belle de l’Adriatique in 2007. The Scenic Eclipse is being built at the Uljanik Group’s Pula shipyard in Croatia, The same yard has built a number of passenger-carrying roll on-roll off vessels for Grimaldi Lines over the past few years. The Scenic story began in 1986, when founder Glen Moroney began operating coach tours around Australia, quickly expanding into New Zealand, Norfolk Island, and South Africa. By the end of the 1980s, Scenic was also hosting tours to Canada and Alaska, and in 2008 it launched its uniquely luxurious “Space Ships” to sail the rivers of Europe. When Thomson Cruises’ 1,504-berth Island Escape was sold recently to Cruise Holdings Inc, it was also announced that Hamburg-based Columbia Cruise Services remain managers for the new owners. The vessel is now at the Damen ship repair facility in Brest, and has been renamed Ocean Gala. Having been built in 1982 as Scandinavia and first introduced on the New York-Bahamas route, this ship is now a 34-year veteran. Some reports had her going to Scandinavia to be used as floating hotel accommodation while others have her going to Latin America later this year to participate in the local cruise trade there. Cruise Holdings Inc is registered in Miami and one name that seems to be associated with the company would indicate connections in the Miami cruise market dating back to the days of Dolphin and Majesty Cruise Lines. Columbia Cruise Services was also named last year to manage the 1,804-berth Thomson Discovery, presently trading as Royal Caribbean’s Splendour of the Seas. 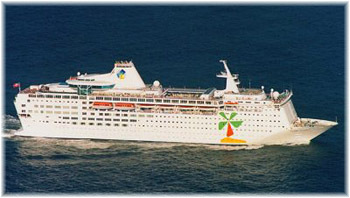 The relationship between Columbia and Thomson Cruises dates back to 2004 with the appointment for the technical management for the Thomson Celebration. The Island Escape and Thomson Dream followed in 2009. Since October, Columbia has also managed FTI’s 412-berth Berlin, which began life sailing for Peter Deilmann. Columbia Cruise Services began as part of the Columbia Ship Management group, based in Limassol, but has been operating out of Hamburg on a stand-alone business since January 2015. The company is solely dedicated to managing cruise ships, expedition ships and luxury yachts.